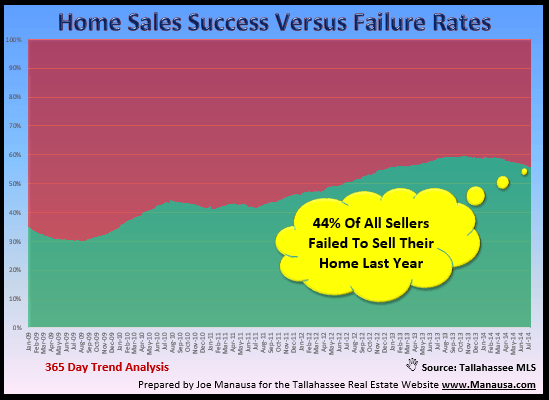 After hitting an 8 year high just one year ago, the home sales success rate in Tallahassee is on the decline. This means that there is a higher percentage of home sellers who leave the market without selling their home than we have seen in the recent past. Currently, only 56% of home sellers who listed a home for sale in the past 365 days were able to sell their homes. So consider what this means for people who are planning on selling a home in the next year. The following real estate graph measures 100% of the homes that leave the market. The one-year trend of homes that sell are shown in green, while the one-year trend of homes that failed to sell are shown in red. Would you reconsider selling your home if you knew that 44% of sellers who came before you recently failed? This is a fact that most sellers new to the market do not realize (that not everybody sells their home). There are more than 5,000 homeowners in Tallahassee who have tried unsuccessfully to sell their home in the past five years, and they have moved to the "shadow inventory" awaiting better times with better home prices. This is a sad outcome that does not need to happen. If you are considering selling your home, make sure you interview agents who demonstrate a clear knowledge of current market conditions. Anybody with a real estate license and a pulse can give you a comparative market analysis for your home, but that does not mean their results will be accurate. Look for a market expert so you get the true sale-ability of your home. Beware of agents who simply churn and burn listings, instead ask the agents you interview for references. You can sell your home in this market, it merely takes correct pricing and an aggressive marketing plan designed to generate multiple buyers for you home. If you would like to know more about getting your home sold (being part of the home sales success rate), just drop me a note and we'll contact you immediately to schedule a time to see your home.